You have probably heard by now that Google Reader is going away on July 1st. Well, Google Reader may be going away, but we don't want YOU to go away, so we hope that you will consider following our blog through bloglovin! We know that change is hard...so we thought we might sweeten it up for you a little bit! 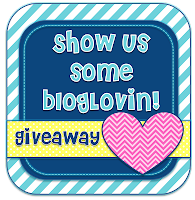 We are doing a giveaway for all of our fabulous followers that take the leap and switch over to bloglovin. You may have already switched over! In that case, this will be an easy entry! If you have not yet switched or are not following our blog through bloglovin, then there are a few easy steps to follow. You can go to our sidebar (that's the column on the right over there that shows our followers) and you can click the button that says Follow this Blog with bloglovin. Or, you can go into the Rafflecopter below and click the link in the first entry, and that will take you to our blog on bloglovin. You will need to set up an account with bloglovin so that you can follow us. Please be sure to leave your bloglovin username in the Rafflecopter entry. We are putting up a ton of new "back to school" products in our TpT store, be sure you follow us on TpT as well. In order to follow us on bloglovin' you will have to sign up for an account. Please be sure to leave your Bloglovin' username in the Rafflecopter entry. Since I can't see the list of followers (yet), I am asking that you "like" this post on Bloglovin' after you become a follwer. I can then see who has like the post and verify the winners. Check out this blog hop for more fun and prizes! Hey ladies!! So happy you were a part of the linky because I wasn't following you before, but of course I am now ;) Owls and pink are my fav!! I'm a new follower! It's so fun to find other 4th grade bloggers! I'm not sure how to "like" this post, but so glad to be following you on Bloglovin' and love your ideas! I'm following you on bloglovin! I would love for you to give some bloglovin love to mysecondgradejournal.